HIRSCHMANN pipette products have been used in laboratories for over 50 years and in over 100 different countries all around the world. Below you can find the best pricing and promotions on new and refurbished HIRSCHMANN pipette fillers or controllers, pipettes and motorized or classic bottle top dispensers. 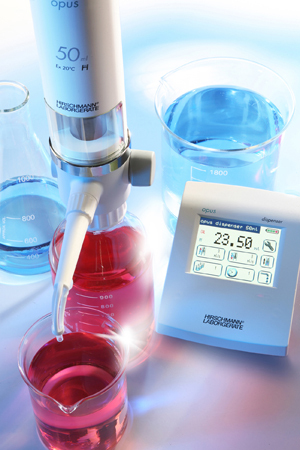 HIRSCHMANN pipette fillers and controllers assist liquid handling by increasing efficiency, speed, and precision. Key HIRSCHMANN pipette products include the HIRSCHMANN Pipetus and Pipetus Jr. Controllers and HIRSCHMANN Ceramus, Opus and Solarus Bottletop Dispensers. The HIRSCHMANN Opus Bottle Top Dispenser is a programmable bottletop dispenser designed to meet the needs of the modern lab. The motorized Opus Bottle Top Dispenser makes liquid dispensing easy, intuitive and quick, while maintaining accuracy and precision. The advanced functionality of stepper and serial dispensing makes the Opus an innovative tool to improve throughput and efficiency in the lab. Furthermore, the TFT touchscreen extends that functionality by making it easy to program, easy to operate and allows users to share the unit without interfering in each other’s work. Superior construction and media recirculation make the Opus a smart purchase for long-lasting quality and efficiency in operation and reagent usage. When it comes to HIRSCHMANN pipette fillers and controllers, the HIRSCHMANN Pipetus is one of the most popular units. The HIRSCHMANN Pipetus is a battery powered pipette filler that is suitable for all pipetting needs in the volume range from 0.1 mL to 200 mL. HIRSCHMANN pipette fillers and controllers are known for their quality and the Pipetus fits that mold. 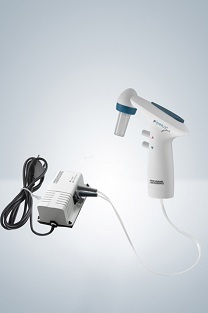 The motor performance of the Pipetus has been increased by 20%, the Pipetus has an easily readable color display, 5-step speed selection for the ideal pipetting speed to suit your application, up to 50 hours of continuous work before charging is needed, noiseless and vibration-free pump and NiMH batteries (cadmium-free). The Pipetus is also equipped with a fine dosing valve and valve pin made from a ceramic compound, and silicon adapter to make sure that any pipette fits tightly. The Hirschmann Opus Dispenser is a motorized bottletop dispenser with an integrated reagent recirculation system. The Opus Dispenser can serially dispense up to 9999 times, perform stepper dispensing at varying partial volumes, and hold up to 9 dispensing procedures in its memory. It is operated via TFT touchscreen. The Hirschmann EM Dispenser PP is designed to perform quality routine lab liquid dispensing at an affordable price. It is made of polypropylene and constructed using a precision ground glass piston. It can be steam sterilized at up to 120 °C. The EM Dispenser PP has a 32 screw thread. Piston made of high-purity aluminum oxide ceramic. 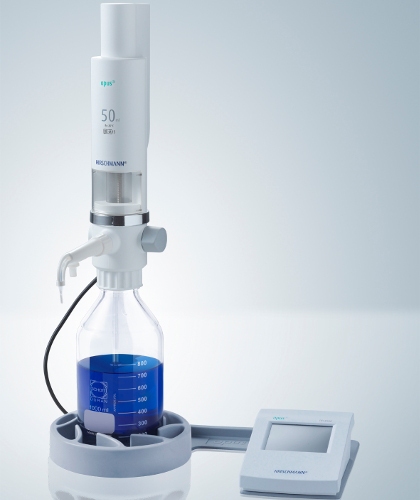 For fixed and variable volumes, from 0.2 mL to 60 mL. The complete unit can be steam sterilized at 121° C without dismantling. Threaded suction hose fitting. User-independent, reproducible volume dispensing. Digital volume configuration engagement, calibrated for a lifetime. Optimum chemical and thermal resistance of parts conveying medium. 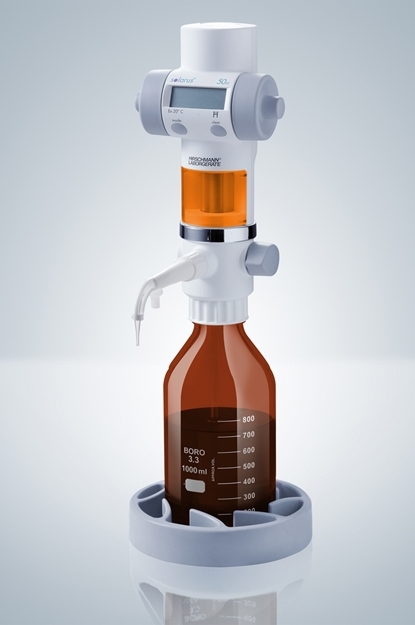 The Hirschmann Opus Titration is a motorized bottletop dispenser designed for titration. The liquid dispensing motor can achieve droplet break-up with only 10uL of titrant, for precision determination. Liquid dispensing, programming, and configuration are controlled through a TFT touchscreen. 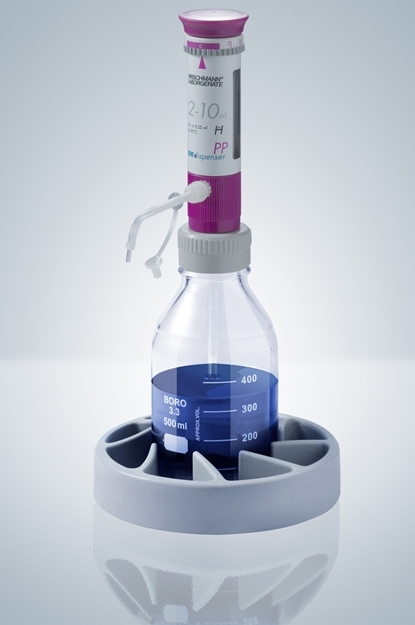 Opus Titration can deliver resolution up to the third decimal place.